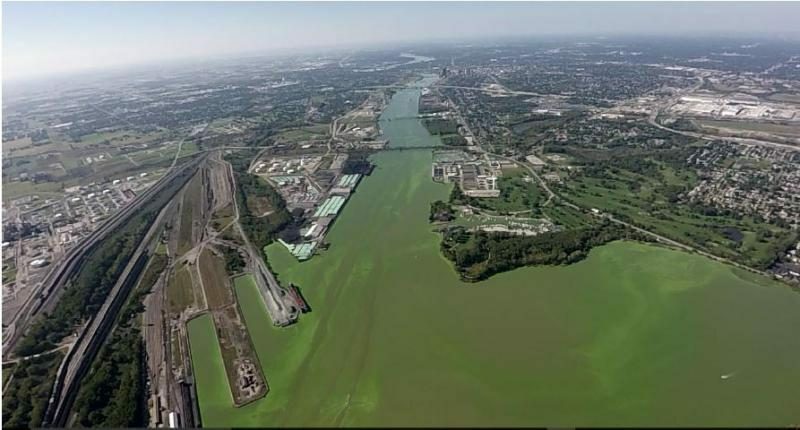 GREAT LAKES TODAY – Canada and the province of Ontario recently released their plan to combat toxic algae blooms in Lake Erie. Phosphorus is the primary cause of the blooms that turn parts of the lake green most summers. The U.S. and Canada hope to reduce phosphorus in Lake Erie by 40 percent, from 2008 levels. It’s all part of the Great Lakes Water Quality Agreement. Under that agreement, Canada and the U.S. must develop plans for reducing phosphorus by 2025. The United States plan – which will summarize five state plans — is set to be released later this week. Canada’s plan includes over 100 actions in the western and central sections of Lake Erie. The list includes limiting discharges from phosphorus sources such as wastewater treatment plants. And it calls forupgrading wastewater collection systems in Leamington, one of the target watersheds. Canada also plans to create a program this year to give money to farmers who take steps to reduce pollution. Canada’s plan lacks projections for how these actions will actually reduce phosphorus. But it orders organizations to establish timelines and calculate costs. Ontario officials say it may be difficult to calculate phosphorus reductions from sources like agriculture. According to the plan, such Canadian sources contributed an average of 78 percent of the country’s total phosphorus load to Lake Erie from 2003 to 2013. Canada will evaluate the success of its plan every five years. Canada and the U.S. also will work together and track progress through the Great Lakes Commission’s ErieStat pilot project. The U.S. plan will summarize recommendations from Indiana, Michigan, Pennsylvania, Ohio and New York. Pennsylvania has a smaller role to play in reducing phosphorus in Lake Erie. There are only eight tributaries in Pennsylvania’s Lake Erie central basin, and they are smaller than watersheds in Ohio and Michigan. Pennsylvania’s plan, released late last year, says it may have already reached a 40 percent reduction in phosphorus loads. The state plans to verify this with research. Ohio is a different story. The majority of the Maumee River flows through western Ohio. And it’s the largest “non-point” source of phosphorus in western Lake Erie — that is, a general source rather than a specific place like a sewage treatment plant. A recent study found that 87 percent of total phosphorus in the Maumee River comes from non-point sources. Ohio’s 60 actions include developing stewardship programs for farmers. Several actions focus on wetland restoration with demonstration projects in the Maumee River and Sandusky Bay. Wetlands protect water quality by filtering sediment and nutrients. Ohio’s plan also includes developing a method to determine if the open waters of Lake Erie are “impaired” – a term used by the U.S. EPA to establish a pollution diet for a body of water. The document says that method will be complete this year. Similar to Canada, Ohio and Pennsylvania plan to periodically review and assess their plans — and make adjustments if needed. Canada will begin reviewing its actions in 2023, Pennsylvania will begin its review in 2022, and Ohio will continously review its plan.